Here at Crossword Hobbyist, we believe in the importance of education for all students no matter their background. That’s why we’re excited to offer the Crossword Hobbyist Crossword Scholarship. 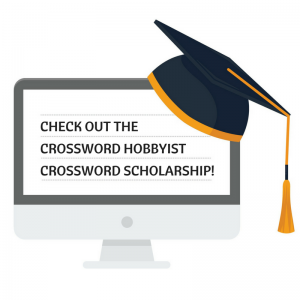 Crossword Hobbyist is offering a scholarship to a current or incoming undergraduate student who will be enrolled for the Fall 2019 semester. Create a free account on Crossword Hobbyist. Go to the “My Puzzles” page from the navigation bar. Click the “Newspaper Style” puzzle button. No matter what theme you choose, the puzzle should meet the standards of professional newspaper-style puzzles as listed here. A submitted puzzle should have a maximum of 78 words. Creators who make puzzles with fewer black squares increase their odds of winning. Email us at [email protected] so we can waive the one time publishing fee. Wait for an email confirming your puzzle has been unlocked. This should take no longer than 24 hours. Publish your puzzle once it is unlocked. Fill out the application form below. We will notify winners through the email listed in the form. Remember, no fees are required of students to apply to this scholarship. You must follow the steps as outlined above. Applications with unpublished or standard-style puzzles will not be considered. And don’t worry – we will not own the rights to any submitted crossword puzzle. All copyrights remain with the creator. We strongly encourage all participants to share their crossword puzzles to their websites, blogs, and social media when available. Successfully creating a crossword puzzle is a huge accomplishment! Sharing it with others is a great way to celebrate. Keep in mind that this is not a requirement for entry. The deadline to apply is April 30th, 2019. The selection committee at Crossword Hobbyist will determine the winning crossword puzzle. The committee will make their selection based on the cleverness of the theme, clues, and answers. A well-executed grid design will also be taken into consideration. The selection will be announced by May 31st, 2019. The scholarship is to be used exclusively for school tuition and related expenses. A check for $1,000 will be made payable to the award recipient’s college, university, or trade school. There is no cost to apply for this scholarship. We will not request any monies from you. The winner of the scholarship is chosen at the sole discretion of the Selection Committee. The winner and the finalists will be announced on May 31st, 2019.